E-Flux Conversations: Paranoid Subjectivity and the Challenges of Cognitive Mapping – How is Capitalism to be Represented? The most shocking thing about the Edward Snowden revelations is not so much their content as the fact that they have been met with little interest or surprise; not because people are unconcerned about the erosion of civil liberties, but because they thought that they knew all of this already. 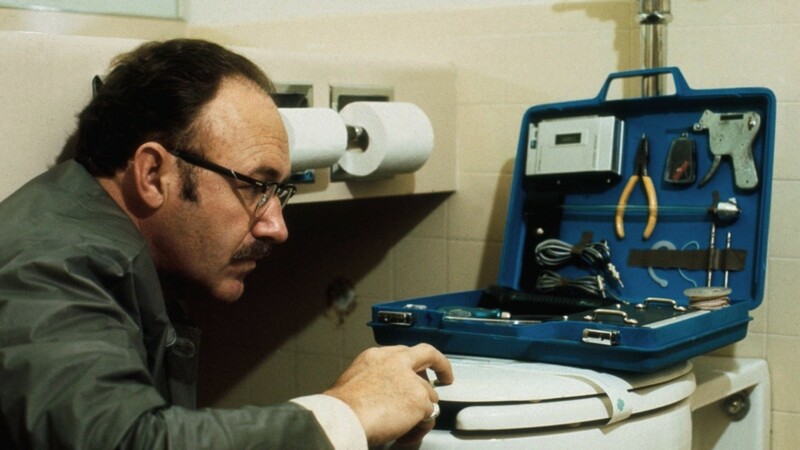 The internet now seems to produce a mode of hyper-connectivity, short-circuiting any separation between public and private. Along with the internationalisation of finance and other aspects of globalisation, this can make it feel as if everything has become completely interconnected, and there is nowhere left to hide from the encroachment of capital. ‘Onewordledness’ is poignantly and hilariously expressed in Hito Steyerl’s video Liquidity Inc. (2014), which deliberately confuses various meanings of the word liquidity (physics, finance, climate, martial arts), showing intricate, but unfathomable links between seemingly unrelated spheres. Steyerl’s work is the latest in a long line of artistic and theoretical reflections on (and of) paranoid subjectivity since the 1960s. From the novels of Thomas Pynchon, paranoia movies such as The Conversation and the films of Adam Curtis, to the rise of systems theory, and notions of the ‘network’ (Luhman), much art and theory from the US and Europe in this period has reflected an increasing interest in modes of cognition either contend with or break down due to the increasing scale of social abstraction. The popular television show The Wire (2002-2008) is a key example, being centered on a dense web of connections which traverse the US city of Baltimore, uniting all of its diverse spheres into a violent and tragic situation that the character Omar simply calls ‘the game’. In this conversation, the third and last in a series that we, David Hodge and Hamed Yousefi, are organizing for e-flux conversations, we would like to critically consider the political consequences of ‘oneworldedness’. Fredric Jameson once said that “Conspiracy […] is the poor person’s cognitive mapping in the postmodern age … the degraded figure of the total logic of late capital, a desperate attempt to represent the latter’s system”.JamesonF86a_CognitiveMapping.pdf1 (155.3 KB) But what if capital’s abstractions interpolate subjects who are unable to undertake a critical cognitive mapping? Can art help to induce new forms of subjectivity, which might be better equipped to trace the totality? 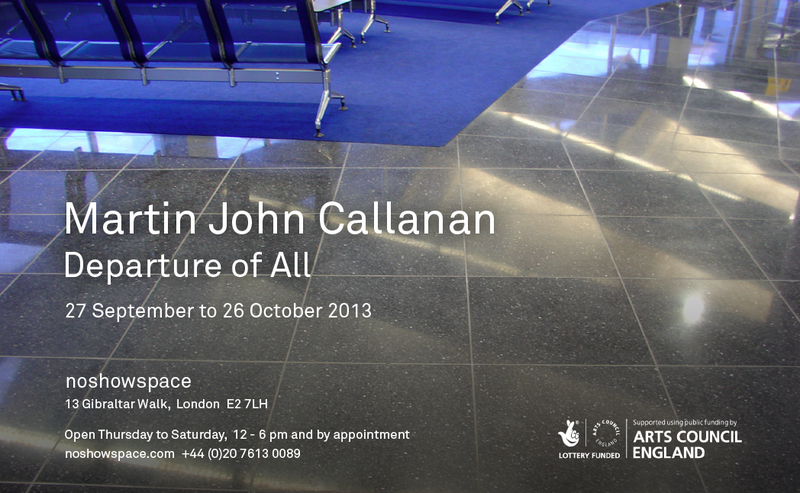 Martin John Callanan ( http://greyisgood.eu) is an artist whose practice involves “researching the individual’s place within systems”. His work has been exhibited and published internationally and he lectures at Slade School of Fine Arts, UCL, London. Alberto Toscano is Reader in Critical Theory at the Department of Sociology, Goldsmiths, University of London. His most recent book is Cartographies of the Absolute (with Jeff Kinkle) – see: https://cartographiesoftheabsolute.wordpress.com. Sarah Brouillette is Associate Professor of English Language and Literature at Carleton University in Ottawa, Canada. She is currently researching “a sort of cultural history of neoliberalism”, focusing on UNESCO as a core case study. Tom Eyers is Assistant Professor of Philosophy at Duquesne University in Pittsburgh, U.S.A. He is the author of three books including Speculative Formalism: Literature, Theory, and the Critical Present (Forthcoming, 2015). British Council: What is Digital Art? The 44th International Film Festival Rotterdam will take place 21 January – 1 February 2015, and include Martin John Callanan’s Departure of All and Text Trends, and Thomson & Craighead’s Flipped Clock in the Signals: 24/7 programme. 24/7 will focus on the changing world & technology, and how the attention economy is affecting our lives, how we consume information and how it dominates not only our waking but also our sleeping moments. Our experience of time is mutating at the speed of light, due to the glass fibre and wireless networks that keep us entangled. How this affects our sense of reality now and its impact in the near future is one of the most important discussions in the world today. In the late 1990s, when Google was barely one year old and was still a privately held company, its future CEO, Dr. Eric Schmidt was already articulating the context in which such a venture would flourish. Schmidt declared that the twenty-first century would be synonymous with what he called the ‘attention economy’, and that the dominant global corporations would be those that succeed in maximizing the number of ‘eyeballs’ they could consistently engage and control. 24/7 is focussed on stimulating discussion on this ‘attention economy’, the global thirst for information and the daily data consumption and mass synchronisation of work and leisure rhythms which are synonymous with this. We are working, communicating and consuming whenever and wherever we happen to be in the world. Divisions between night and day, between rest and work are gradually disappearing. Our experience of time is mutating at the speed of light, due to the glass fibre and wireless networks that keep us entangled. Therefore 24/7 forces the audience to step out of the cinema, into hotels. A hotel is just like a cinema, a place where one checks in to step out of the daily routine. They are open 24/7 and strongly associated with our need for sleep. While examining the ever-changing world of the 21st Century, this programme challenges the traditional notion of a film ‘slot’ by raising the question of what we now class as a ‘normal duration’. This large survey book builds on the ZKM Karlsruhe exhibition tracing the multifaceted relationship between art, science and technology in Dutch landscape art around 1650. 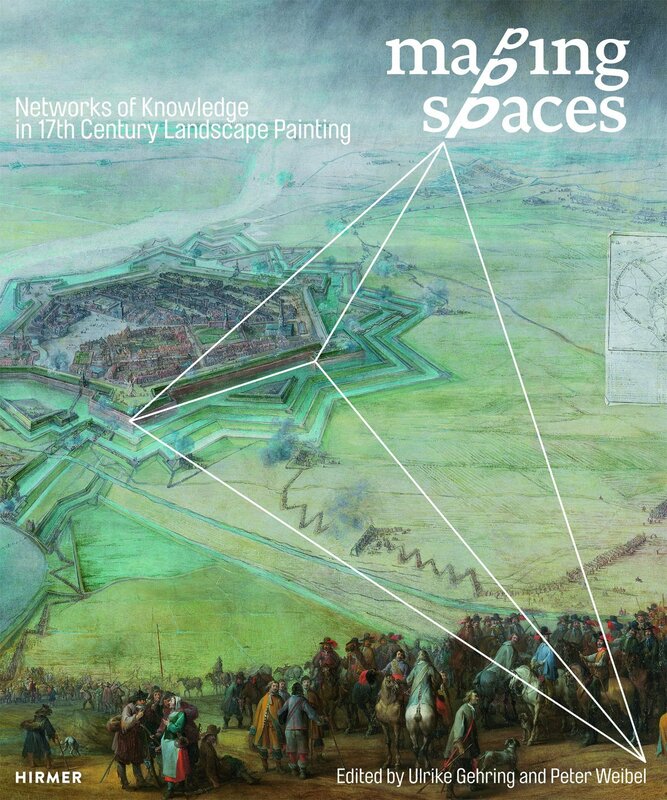 Long before digital satellite imagery, Dutch artists used modern systems of remote sensing. Their art works provide valuable insights into past exchanges of knowledge that anticipate the techniques of mapping used today. Includes Martin John Callanan’s A Planetary Order. MK Gallery, 900 Midsummer Boulevard, Central Milton Keynes, MK9 3QA. January 2015 MK Gallery presents How to Construct a Time Machine (23 January – 22 March 2015), an exhibition of over twenty-five historical and contemporary works that explore how artists play with media in innovative ways to transform our experience of time. What is time? How do we order the past, the present, and the future? Why are artists interested in time? How is art a machine, vehicle, or device for exploring time? How is art a means by which time ‘travels’, and how does art permit us to travel in time? Consideration of these and other questions has provided the exhibition rationale for guest curator, Dr Marquard Smith, Head of Doctoral Studies/Research Leader in the School of Humanities at the Royal College of Art, London. The show’s title is taken from an 1899 text by the avant-garde French writer, Alfred Jarry, written in direct response to H. G. Wells’ science fiction novel The Time Machine (1895). Wells invented and popularised a distinctively modern, fictional concept of time travel, with the time machine as a vehicle that could be operated ‘selectively’.Jarry’s response crafted a pseudo-scientific fiction that presents the time machine and time travel as an instance of ‘the science of imaginary solutions’. Taking this idea of the time machine, time travel, and perhaps even time itself as an instance of ‘the science of imaginary solutions’, the exhibition is divided thematically across the galleries and includes works by John Cage, Martin John Callanan, Jim Campbell, Edgar Cleijne and Ellen Gallagher, Matt Collishaw, Ruth Ewan, Tehching Hsieh, the Lumière Brothers, Chris Marker, Kris Martin, Manfred Mohr, Melvin Moti, Nam June Paik, Katie Paterson, Elizabeth Price, The Otolith Group, Raqs Media Collective, Meekyoung Shin, Sun Ra, Thompson & Craighead, Mark Wallinger and Catherine Yass, amongst others. Film work ranges from George Méliès’ A Trip to the Moon (1902), an iconic silent movie which follows a group of astronomers as they explore the moon, to Thomson & Craighead’s The Time Machine in alphabetical order (2010), a complete rendition of the 1960s film version of the Wells’ novella re-edited into alphabetical order. Sculptural work includes Mark Wallinger’s Time and Relative Dimensions in Space (2001), an aluminium version of Dr Who’s ‘Tardis’ police box that simultaneously disappears into the space-time continuum and reflects its own surroundings, and Ruth Ewan’s We Could Have Been Anything That We Wanted to Be (2012), a decimal clock which divides the day into ten (rather than twenty-four) periods, echoing a bold 18th century French Republican attempt to redefine and rationalise the day. 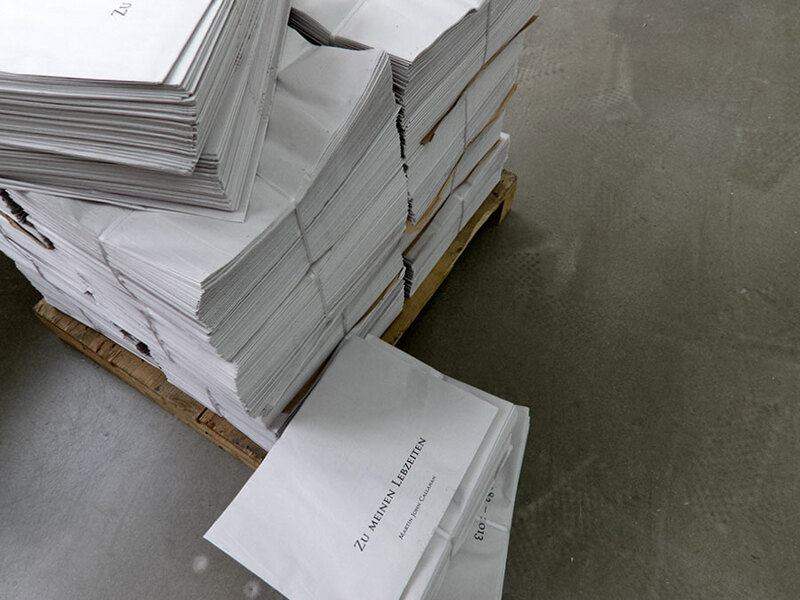 The exhibition will be accompanied by a catalogue, designed by Herman Lelie, featuring an extended Introduction by the exhibition’s curator and a translation of Jarry’s How to Construct a Time Machine, together with essays by Dutch cultural theorist and video artist Mieke Bal and radical philosopher Peter Osborne. The exhibition will be supported by a range of related events including tours by the curator and artists, seminars, academic conferences, and film screenings. Out now, the new survey book Art and the Internet features Martin John Callanan, Brighid Lowe, Thomson & Craighead. Art and the Internet is a much-needed visual survey of art influenced by, situated on and taking the subject of the internet over the last two and a half decades. From the early 1990s the internet has had multiple roles in art, not least in defining several new genres of practitioners, from early networked art to new forms of interactive and participatory works, but also because it is the great aggregator of all art, past and present. Art and the Internet examines the legacy of the internet on art, and, importantly, illuminates how artists and institutions are using it and why. 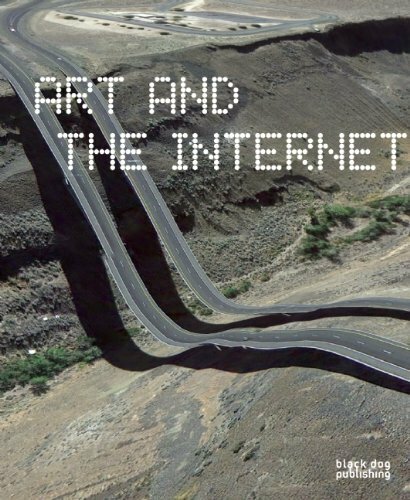 Art and the Internet features newly commissioned essays about the history, development and future of art and the internet from leading writers and curators in the field. By breaking down art on and about the internet into distinct forms as chapters – such as “Net.Art”, “social media influenced art”, “Post-Fordist art”, “activist art”, “surveillance-related work”, “post-internet art”, “internet-enabled participatory, interactive and video art” – the book deals with these challenging categories, with each illustrated by the work of leading practitioners. A selection of reprinted essays and manifestos, along with new interview material, offers an alternative chronology of the internet via the changing ‘of the time’ opinions from the late 1980s until today. The newly commissioned essays foreground the wider cultural context of the subject, laying out a longer history in art, design, technology and software that pre-dates the internet’s wider use, illuminating the cultural conditions and modes that made way for contemporary art using the internet. The changing role of the artist online is discussed. A concluding essay examines how the multifarious global art worlds use the internet, from activism to voyeurism to marketing, featuring organisations such as Rhizome and e-flux and their predecessors, illuminating how the internet has irrevocably altered the art world as a whole. As such, Art and the Internet is an essential book for all those interested in art whether directly involved in internet art or not. Martin John Callanan (b. 1982) lives and works between London and Berlin. Recent exhibitions include ‘Open Cube’, White Cube, Mason’s Yard, London (2013); ‘Along Some Sympathetic Lines’, Or Gallery, Berlin (2013); Whitstable Biennale (2012); Harrach Moya Gallery, Palma (2012) and ‘Deed Poll’, a performance at Whitechapel Gallery London (2012). Callanan graduated from The Slade School of Fine Art in 2005 and is currently a Teaching Fellow in Fine Art Media at the Slade School of Fine Art, University College London. A publication accompanies the exhibition with contributions from Pau Waelder and Domenico Quaranta. An aseptic space. One white table and on it a printed directory, accompanied by an apparently normal looking telephone. It would seem the right environment to make a call. And calls are, in fact, made. The phone operates automatically, dialling random numbers from the many listed in the phone book . The diffused audio allows visitors to listen to the classic dialling sounds, followed by a precise dead tone or a message saying, in varying languages, ‘the number you dialled does not exist’. The process repeats itself tirelessly; another number, another country, another language. A loop of sounds and dead time; a form of a dance, a ritual. A monologue or perhaps a soliloquy. No matter which of the many available numbers are dialled, it is certain that no calls will ever be answered because the list of numbers is officially exposed as The International Directory of Fictitious Telephone Numbers – an extensive list of numbers certified as non-existent and neatly divided into geographic areas of the world. The compilation of this phone book includes official requests from telecommunication regulators in different countries. 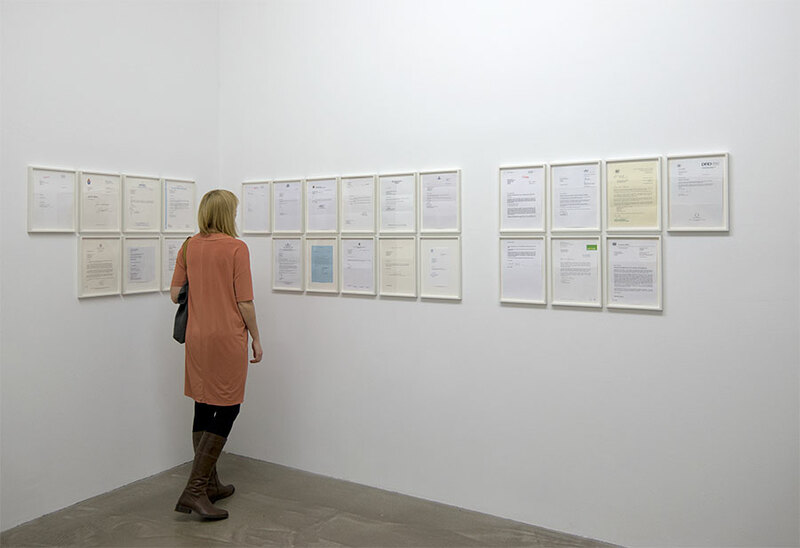 The artwork, resulting from research by the British artist John Martin Callanan and presented first in Spain and then at the Whitechapel Gallery in London, is indefinitely offered as a resource for use in drama or film productions so that unsuspecting people aren’t disturbed by inquisitive viewers. Art in defence of privacy? Your chance to get hold of issue #3 of Text Trends newspaper. 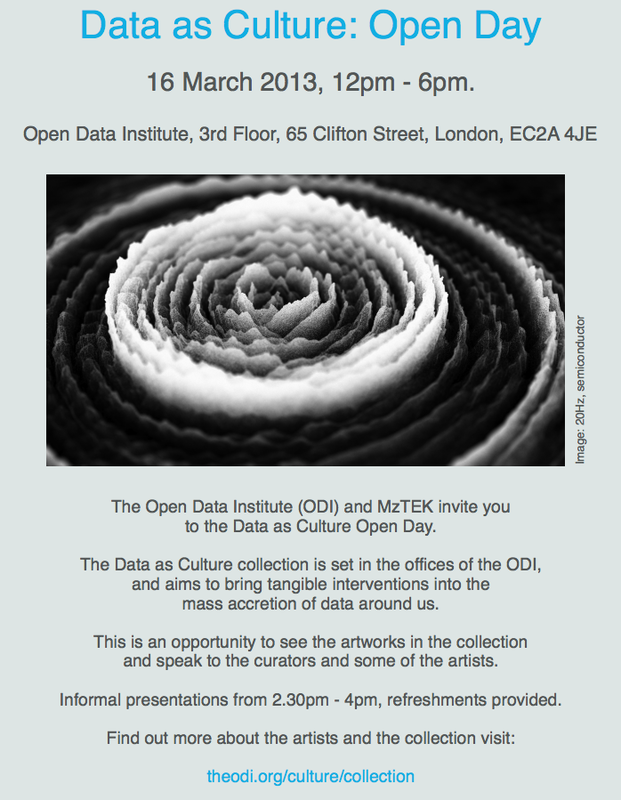 The Open Data Institute (ODI) and MzTEK invite you to the Data as Culture Open Day. mass accretion of data around us. This is an opportunity to see the artworks in the collection and speak to the curators and some of the artists. Informal presentations from 2.30pm – 4pm, refreshments provided. 16 March 2013, 12pm – 6pm. Professor Susan Collins gave a UCL Lunch Hour Lecture about SCEMFA. Martin John Callanan’s artworks Location of I and I Wanted to See All the News From Today featured in the forthcoming book Art and the Internet by Joanne McNeill and Domenico Quaranta. 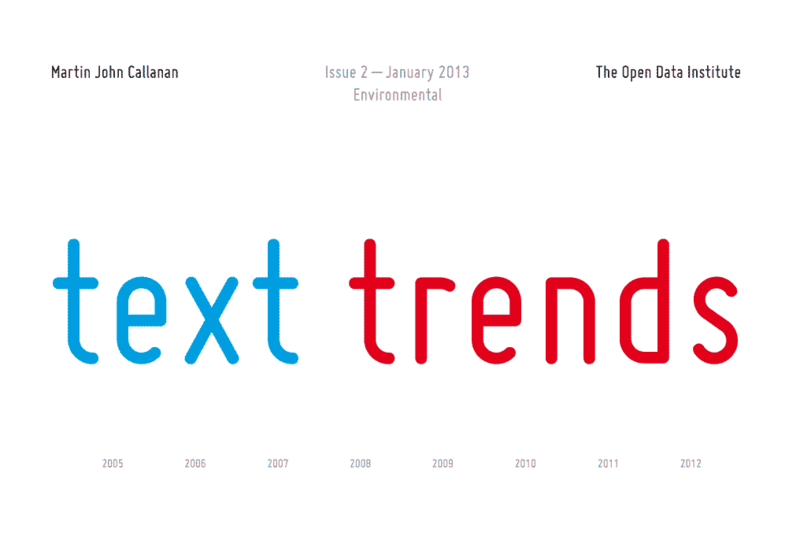 The second issue of Callanan’s Text Trends newspaper, looking at environmental data, will be available in limited numbers from 14 January 2013 at The Open Data Institute. Over the past twenty years, global climate change has emerged as the overarching narrative of our age, uniting a series of ongoing concerns about human relations with nature, the responsibilities of first world nations to those of the developing world, and the obligations of present to future generations. But if the climate change story entered the public realm as a data-driven scientific concept, it was quickly transformed into something that the ecologist William Cronon has called a ‘secular prophecy’, a grand narrative freighted with powerful, even transcendent languages and values. And though climate science can sometimes adopt the rhetoric of extreme quantification, it also — as has been seen throughout this book — relies on the qualitative values of words, images and metaphors. This can even happen simultaneously: during the discussions that led up to the IPCC’s Third Assessment Report of 2001, for example, a room full of scientists discussed for an entire week whether or not to include the three-word phrase ‘discernable human influence.’ Only three words, perhaps, but three extremely potent words (both qualitatively and quantitavely speaking), that between them tell a vast and potentially world-altering story. Martin John Callanan’s ongoing Text Tends series offers a deadpan encounter with exactly this kind of quantification of language. Using Google data the series explores the vast mine of information that is generated by the search engine’s users, each animation taking the content generated by search queries and reducing the process to its essential elements: search terms vs. frequency of search over time, presented in the form of a line graph. In the online manifestation of the Text Trends animations the viewer watches as the animations plot the ebb and flow of a series of paired search terms keyed into Google over the last ten years by Internet users around the world. In the case of the environment sequence featured here, pairs of words such as: ‘nature’ — ‘population’; ‘climate’ — ‘risk’; ‘consensus’ — ‘uncertainty’; ‘Keeling curve’ — ‘hockey stick’, spool out matter-of-factly, like a live market index, allowing the implied narrative content of these word comparisons (along with their accumulated cultural and emotional baggage) to play themselves out before us. In contrast to the hyperinteractivity of emerging news aggregators and information readers, Text Trends explores our perceptions of words presented as connotation-rich fragments of continually updated time-sensitive data. As an investigation into both the generation and representation of data, Text Trends offers a visual critique of the spectacularization of information, a cultural tic that continues to generate the endless roll of statistically compromised wallpaper that surrounds so much public science debate, and which our book — Data Soliloquies — has in large part been about. 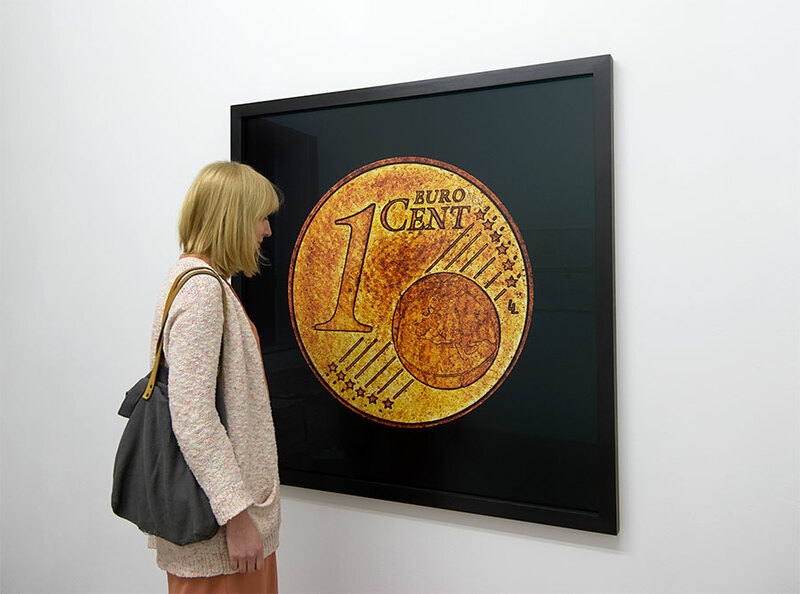 The Live 2011 Grand Prix jury has also decided to distinguish several works. Honorary mentions include: I Wanted to See All of The News from Today by Martin John Callanan, as best online project.